There is always one thing you can count on in the earlier Friday The 13th films and that is finding gimmicks to sell the fans on the next sequel in the franchise. Every film has one, albeit some are bigger than others. The biggest gimmick to date back in 1989 had Jason Voorhees trekking out to Manhattan and Times Square to finish off the remaining kids of the last graduating class of Crystal Lake High. Would you think Friday The 13th Part 8: Jason Takes Manhattan to be the weirdest sequel of the franchise? 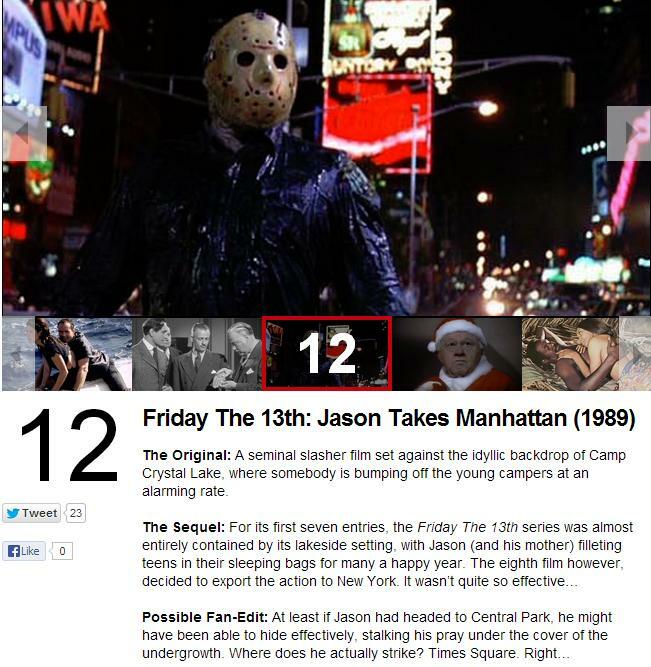 Well, Total Film has taken it upon themselves to rank Jason Takes Manhattan in their 100 Weirdest Movie Sequels. Where does Part 8 rank? It may be surprising, but the film ranks #12 on the all time list. Don't worry, Jaws: The Revenge and Leprechaun In The Hood are ranked ahead of it! At any rate, if you would like to see all of the 100 films ranked, make sure to visit Total Film' list and let us know what you think of Jason's Manhattan adventure ranking in the list!